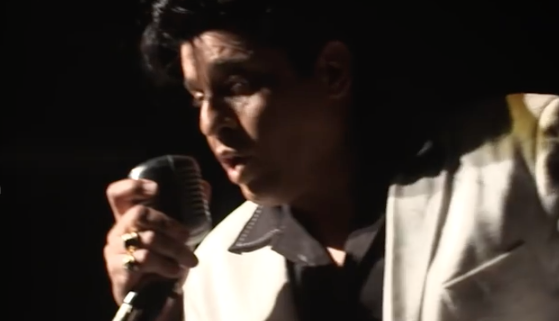 FROM THE LEGENDARY SUN HITS “THAT’S ALRIGHT MAMA” AND “GOOD ROCKIN’ TONIGHT” TO THE MAJESTIC LAS VEGAS CONCERT PERFORMANCES OF “IN THE GHETTO” AND “SUSPICIOUS MINDS”, THIS BREATHTAKING JOURNEY THROUGH THE LIFE AND TIMES OF THE KING IS SIMPLY UNMISSABLE. INCLUDING THE JORDANAIRES (DON’T BE CRUEL, A FOOL SUCH AS I); THE HOLLYWOOD MOVIES (JAILHOUSE ROCK, KING CREOLE, VIVA LAS VEGAS) AND THE STUNNING ’68 TV SPECIAL, WITH HEARTBREAK HOTEL AND IF I CAN DREAM. PACKED WITH OVER 50 GOLDEN GREATS, AND SPANNING 3 DECADES OF HITS, THIS SHOW DELIVERS ON EVERY LEVEL: COSTUME, LIGHTS – AND ACTION! THIS IS AS CLOSE AS YOU CAN GET TO THE KING – AND YOU MIGHT EVEN GET A SCARF!